The 2017 NLL draft was this past Monday so as I always do, I made my way down the QEW to the TRAC to sit in the crowd. I’m sure Stephen Stamp will do a comprehensive write-up on IL Indoor before long on who went where, what teams did well, and what teams didn’t. I’ll touch on the draft results themselves a little bit but this article will mostly describe my experience there. We had one trade announced before the draft started. BC boy Anthony Malcom was sent to Vancouver along with the 12th overall pick (Ottawa’s Ryan Fournier) from Buffalo, who received Ontario boy Jordan Durston. Both players now play closer to home, so they both win. As for the teams involved, the Stealth picks up a righty who averaged 3.4 points per game in 2017 while the Bandits get a lefty who averaged 2.4. I imagine Evan Messenger is quite pleased about the new opening on the left side that he may be able to fill. There was talk that the Bandits picking up a lefty immediately before the draft might indicate that they were going to pass on lefty Josh Byrne at #1. They didn’t, so after the very first pick, the Bandits had strengthened their left side with two players. After Byrne went first, we all knew what was coming next. In the words of the commissioner: “With the second pick in the 2017 entry draft, the Rochester Knighthawks select… wait, what? Is this right? Curt, are you sure about this? Um… he’s nodding. OK then. The Knighthawks take Jake Withers” That may not be verbatim, I don’t remember exactly. There are always surprising picks in the draft but Rochester skipping over Zack Currier was one of the bigger ones. The biggest question prior to the draft was whether the Bandits would take Byrne or Currier first overall and the assumption was that the Knighthawks would take the other one second. To see Currier drop to third was surprising and I’m sure there were mini fist pumps all around the Roughnecks table. 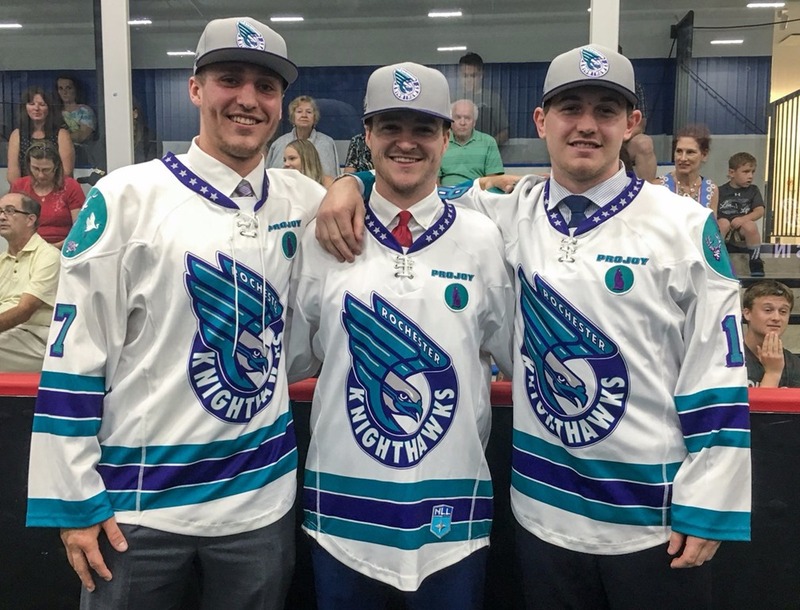 The picture here features the three Knighthawks first round picks: Eric Fannell, Austin Shanks, and Jake Withers (left to right), all Ohio State boys. See the ghostly image behind the guy in green at the back? That’s me. I mean no disrespect to Jake Withers, who was ranked #3 in Stamper’s list, so it’s not like the Knighthawks selected some nobody. But considering Currier’s performance in the Mann Cup just last week and the fact that his brother is already a Knighthawk, that seemed like a perfect fit. Then again, how many really dumb lacrosse decisions has Curt Styres made since taking over the Knighthawks? Not many. I was sitting in the back row of the stands, and talked a little to the guy sitting next to me. He mentioned that his son was in the draft pool, and was hopefully a late-rounder. They were from BC and his son played for the Jr. Langley Thunder. The dad was clearly a big lacrosse fan and told me when certain teammates, former teammates, or opponents of his son were drafted. In most cases he had positive things to say but there were a few cases where he obviously wasn’t too impressed. As the night went on and his name wasn’t called, his son got more and more anxious, texting his dad “This is tough” after hearing yet another teammate get picked. He came back to sit with his dad in the fifth round or so. I didn’t talk to him directly, but I started to feel bad for the kid. What if he doesn’t get picked at all? What do I say to them after the draft when I’m leaving? “Nice talking to you, have a good trip home, sorry your dreams didn’t come true”? I started to get a little nervous about what I’d say but remembered that however bad I felt, he’d feel worse. And then it happened. “With the 53rd selection, the Calgary Roughnecks select Mitch McDole”. The kid simply whispered “YES” and got up and headed to the front. Before I could even wish his dad congratulations, he was off following him, just like I would if it were my kid. Just like Jordan Kanscal two years ago (who also went to Calgary), I was excited when his name was called. Congratulations Mitch, I will be watching for you at the Calgary training camp. One other thing that Mr. McDole reported was that at the previous weekend’s combine, there was a 42-year-old goalie. He said he wasn’t very good… at all…. but hey, kudos to him for trying out. I agreed with that. The next day I found that the 42-year-old goalie was none other than Aaron Freeland, formerly known as Meathead on the IL Indoor message board. I met Aaron once in Rochester (he’d had a few large green drinks by that point so probably doesn’t remember), but have talked to him numerous times on the message board and on Twitter. He posted something on Facebook saying that he applied on a whim and fully expected to get rejected. When he didn’t, he decided to get out there anyway because why the hell not. Not everyone would have the guts to get out there at age 42 and face shots from 20-year-old lacrosse players, so I’m impressed. Nice job Aaron. There were a few trades throughout the evening but other than the Malcom/Durston deal, none involved players. I believe every trade announced was team A sending the very next pick to team B for a pick in the same round in 2019 or 2020. Team B is now on the clock. One of the reasons I love going to the draft is sitting near the families of players selected. Watching and hearing the parents, siblings, and girlfriends standing up, applauding, and cheering while the player walks to the podium is heartwarming. That said, it’s really heartbreaking to see hatless kids sitting during the sixth round, as the possibility of their being drafted dwindles. At 7:56pm, Nick Sakiewicz announced the 14th overall pick for the Rochester Knighthawks. A minute later, the NLL twitter account tweeted out the 4th pick. Way to keep up, guys. The 2018 NLL Pronunciation Guide is already underway, thanks to first rounder Anthony Joaquim. His last name is not pronounced wa-KEEM as one might expect, it’s actually JOKE-em. No JOKE. At the previous drafts, they broadcast Stephen Stamp’s and Andy McNamara’s analysis over the speakers but this year they did not. Instead, they had some classic rock playing quietly over the PA. They played Bryan Adams, Men At Work, the J. Geils Band, John Mellencamp (Black Wolves GM Rich Lisk is a fan), the James Gang, Tears for Fears, and a bunch more. Jack Goods even reported JT singing JB.